IMPORTANT: Once an XML configuration file is deployed to a device, the ActiveEdge settings panel can no longer be used to change settings on that device, only to display them. The ActiveEdge settings panel presents a UI on the device to allow the device user to make changes to Touch Zone settings as needed or desired. This panel becomes "read-only" and cannot be used to change settings if the device is configured remotely using an XML configuration file. Start or Stop ActiveEdge Service - toggles the ActiveEdge service on and off, which enables and disables the ActiveEdge Touch Zones. Service must be stopped before changing other settings. 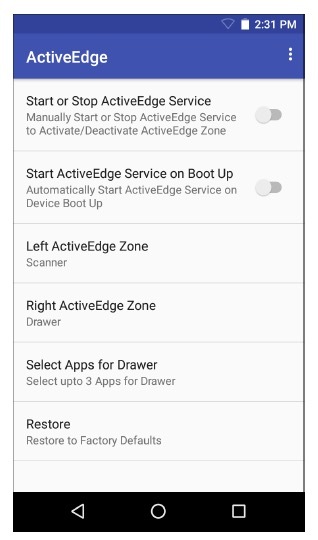 Start ActiveEdge Service on Boot Up - determines whether ActiveEdge runs when the device boots up (enabled by default). Left ActiveEdge Zone - configures the left-hand Touch Zone for Scanner, App Drawer or None. Right ActiveEdge Zone - configures the right-hand Touch Zone for Scanner, App Drawer or None. Select Apps for Drawer - permits selection of as many as three applications to appear in the Drawer. Apps must already be installed on the device. Restore - returns all settings to factory defaults. The ActiveEdge service must be stopped before making changes through the settings panel. The settings panel is read-only if the app has been configured remotely (via XML file). Only one Touch Zone can contain an App Drawer at a time. To display the ActiveEdge version number, tap the Settings (dots) menu->About. Each of these steps is detailed below. Use a text or XML editor to create an XML file and configure it for the desired ActiveEdge behavior based on the settings described below. As a starting point, copy the sample ActiveEdgeConfig.xml file below. Paste it into the editor and change settings as desired. Save the file on the host computer as "ActiveEdgeConfig.xml" (note spelling and letter case). WhiteListPackageNames / BlackListPackageNames - a comma-separated string containing the package name/activity of each app specified as white (enable) or black (disable). The ActiveEdge Mode parameter determines which list is used for WhiteListing or BlackListing. The values are saved even if mode "All" is specified. To activate all app activities, specify package name without an Activity (i.e. com.symbol.datawedge). DrawerPackageNames - configures the list of apps in the App Drawer through a comma-separated string containing the package name(s) of app(s) to be placed in the drawer. The maximum number of apps in a drawer is three. Listed apps beyond the first three are ignored. Specify package name only (i.e. com.android.dialer) to launch the default activity. Specify a specific activity (i.e. com.symbol.datawedge/com.symbol.datawedge.DWDemoActivity) to launch app with that activity. Note: The list of drawer package names is saved regardless of whether an App Drawer is enabled. LaunchAppLeft / LaunchAppRight- allows an application package name to be specified (i.e. com.android.browser) for launch if/when the LaunchApp parameter is enabled for the Touch Zone. Note: The specified package name is saved regardless of whether a Touch Zone is configured to launch an app. The XML file is typically deployed by an organization's EMM system, but can be pushed to devices by any available means. Deployment is governed by the rules below. File names are case sensitive; all references to the file (i.e. from EMM commands or intents) must match exactly. The XML file is opened and its XML validated. If the XML is invalid, processing stops, a message is appended to the system log, and an ActiveEdge result intent is broadcast (see below for details). If unexpected or erroneous elements are present, an error is reported via the ActiveEdge result intent, processing is stopped and no ActiveEdge Service changes occur. If the file is valid, the settings are saved. Aside from malformed XML parameters, an “invalid XML” message results if left and right ActiveEdge Zones are both set to "Drawer" (check settings panel for the end result). Settings are saved only if all XML is valid. If valid XML contains only some settings, the included settings are changed. Each XML parameter has a corresponding Android Shared Preferences reference used by both the AE Service and AE setting panel. After XML is processed successfully, the ActiveEdge settings panel UI is locked; settings can be read but no longer changed by the user. Note: To restore the settings panel UI to user control, push an ActiveEdgeConfig.xml file containing a "Restore" Service Action to the device. This action returns ActiveEdge to its factory default settings.